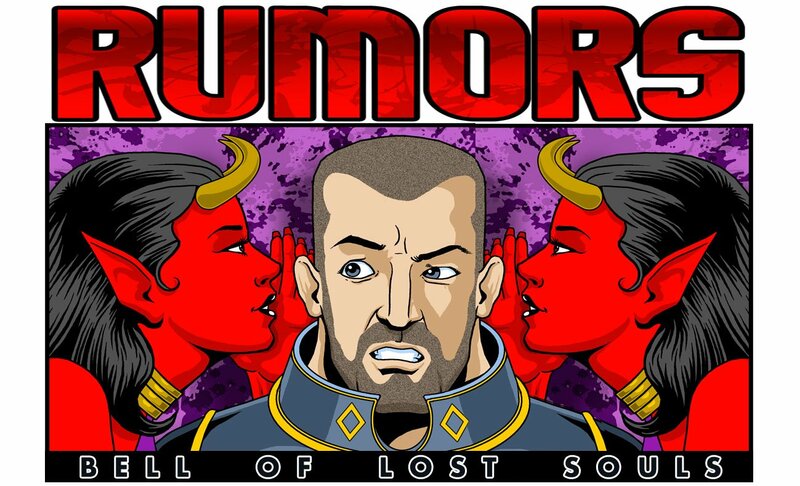 With Genestealer Cults around the metaphorical corner, more rumors are coming out of the woodwork. 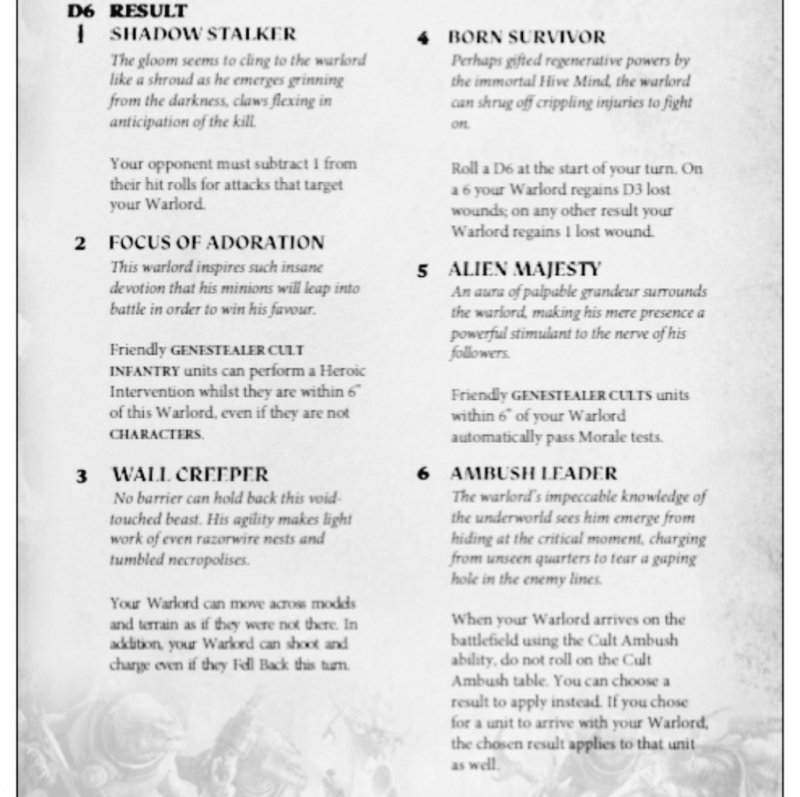 Here’s a look at rumored stratagems and warlord traits. The Genestealer Cults are an army that’s known for being sneaky, using ambush and infiltration tactics to blend in and accomplish their objectives, and for layers of deception wrapped around an all-devouring truth. The same holds true for their rumours, as we’ve seen even more fakes and other trickery around this particular codex. While it all seems appropriate, just bear that in mind, and maybe take them with an extra grain of salt–that said, is not unreasonable to expect some leaks at this point. These come to you from Blood of Kittens and show off their rumored Warlord Traits and Stratagems. These certainly seem reasonable, and even play with Cult Ambush. Of these six, the -1 to hit is probably the most consistent one, but Wall Creeper does make for some interesting charges across tall terrain. Sabotaged! (1CP) – When an enemy unit is destroyed and has an explosion effect, do not roll any dice – that effect automatically triggers. Confusion in the Ranks (3CP) – Choose an enemy unit in your opponent’s army. Select one of its aura abilities – that ability cannot be used until the start of your next turn. Final Detonation (3CP): Use this stratagem at the start of the fourth battle round. Roll a D6 for each unit on the battlefield. On a 1-3, the unit being rolled for cannot advance this battle round. On a 4+, the unit being rolled for suffers a mortal wound and cannot advance this battle round. The Anointed one Rises: Use this stratagem if an Abominant is slain. At the end of the phase, that model is set up again, as close as possible to the previous position and more than 1″ from enemy models, with D3 wounds remaining. Density Analysis Lenses (1CP) Ignore cover on chosen target. Inhuman Reflexes (2CP): A unit gets a 5++, or has its invulnerable save increased by 1. Industrial Brutality (1CP) – Double the attacks of all mining weapons in an acolyte squad (rock saw, rock drill or rock cutter only). Frenzied Hammering (2CP) – Select a unit of Aberrants – each model in that unit increases its attacks by D3 (roll once for the whole unit), but takes a -1 to hit rolls. Strength of Faith (1CP) – 5+ feel no pain, but only vs. mortal wounds in the psychic phase. Demolition Claw (1CP) – When a unit with demolition charges makes its attacks while embarked within a goliath truck/rockgrinder. That units demolition charges are not expended in the attack. Deliverance Broodsurge (1CP) – Allows a unit embarked on a Goliath Truck to disembark after it moves, though for each one that disembarks roll a D6 – for every roll of 6+ the unit takes a mortal wound. Numbers beyond counting (3CP) – Remove a unit from the board, next turn deploy it via Cult Ambush at its full strength. Now many of these look familiar. Numbers Beyond Counting makes a lot of sense–Tide of Traitors is already the perfect stratagem for Chaos Cultists, these other Cultists may as well have it too. And the 1CP/Ignore Cover stratagem I think we’ve seen before. Far more amusing–and fitting are the Sabotaged and Final Detonation abilities, which seem particularly on brand for the GSC. At any rate, that’s it for now. Be sure and check back for more rumors and news as the codex creeps closer. Which of the rules rings true to you?